The Walking Dead premieres its Season 5 episode tonight, and I am so excited! My best friends got me into the show pretty recently, and I already have become a fan of the show. Now, I think the show is ridiculous. It has some really good moments, but some of the main characters make me so angry so often, and some of the scenes are just so hilariously over the top and predictable. BUT! The producers are doing something right, because I can't stop talking about the show with my friends! 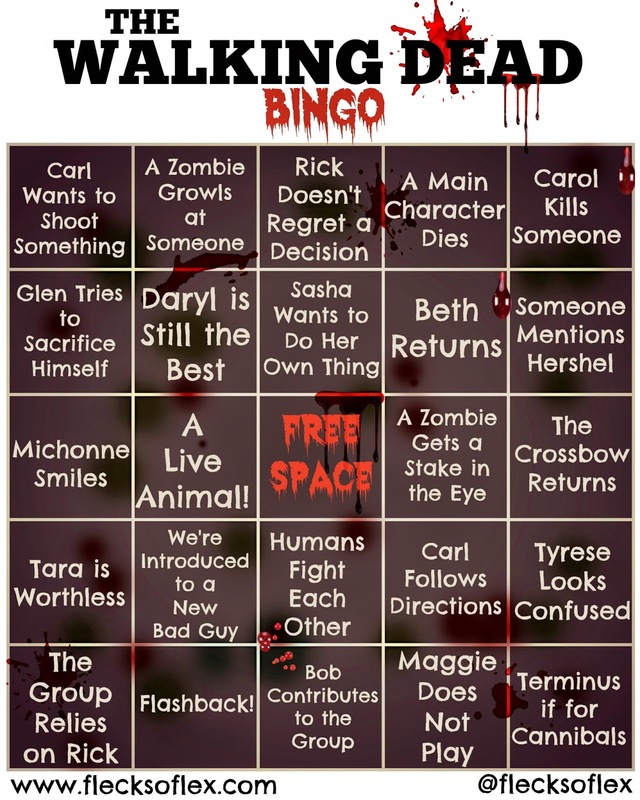 As you can tell from the title of this post, I put together a bingo board for The Walking Dead. As I have done in the past, I put together some exercises to go with the board to keep you occupied during the commercial breaks. Keep in mind that I am not a fitness professional, and that you exercise at your own risk! Before the show begins, make sure that you check out the board to see what's on it. There are a few curve balls thrown in that are very unlikely to happen during any episode this season (try to guess which ones they are). Each time you complete a row/column/diagonal, you must do one of the bulleted items below in that order. If you complete each of the items, start back at the beginning! Count the number of zombies you see between each commercial break. When you reach a commercial, do one mountain climber for each zombie. Do one push up for each time Daryl gives someone the stink eye. Pick a character. If they live through the episode, you have 20 crunches. If they don't survive, you have to do 20 sit ups. Each time someone mentions a character that has died, do 5 push ups. Do you have some other good challenges for this episode? If so, feel free to share them in the comments section! Are you going to watch The Walking Dead season 5 premiere tonight? Who is your favorite character? What do you like about the show? Did you play along with the bingo board during the show? P.S. Scandal fans, never fear! I have my latest board scheduled to post Thursday morning!